The pet food sector is the most lucrative category in the pet industry, making pet retailers in the United States collectively up to $8 billion per year. 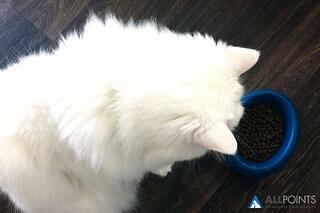 Breaking it down even further, 41% of pet retailer sales came from dog food, supplies and accessories in April 2017, with just 9.4% from cat food and supplies. That's a lot of dog food. With pet food making up such a large portion of the pet industry, you may be wondering whether you're taking advantage of all the potential the category has to offer to boost your sales. If so, you're not alone. Pet Age recently found that 32% of pet retailers who responded to a survey reported that increasing sales volume in their store is their biggest challenge in the next two years. Not only are these stores trying to increase the volume of products they're moving through their doors, but they also have a lot of competition. In the same survey, 56% of retailers reported that competing against big box and e-commerce shops are also their biggest challenge. With the amount of potential pet food offers the retail market, there's no doubt that focusing on the lucrative category is a good way to increase sales volume. The problem is, there's so much competition that it can seem nearly impossible to win over your customers. Here's a few creative ways to increase your store's profits by boosting your pet food sales. 2017 is the age of internet marketing, and if you’re not participating then you’re missing out on a great opportunity. In fact, Pet Age shared a survey conducted with pet specialty retailers in their annual Retailer Report in January 2017. In the report, they shared that 42% of respondents reported that internet marketing (including email, website, & social media) produced the best results in 2015 out of any other advertising medium (pg. 21). There are many ways to create successful internet marketing campaigns. One great way to lure in customers from the web is by managing your website presence and making sure it's optimized for local pet owners in your area. 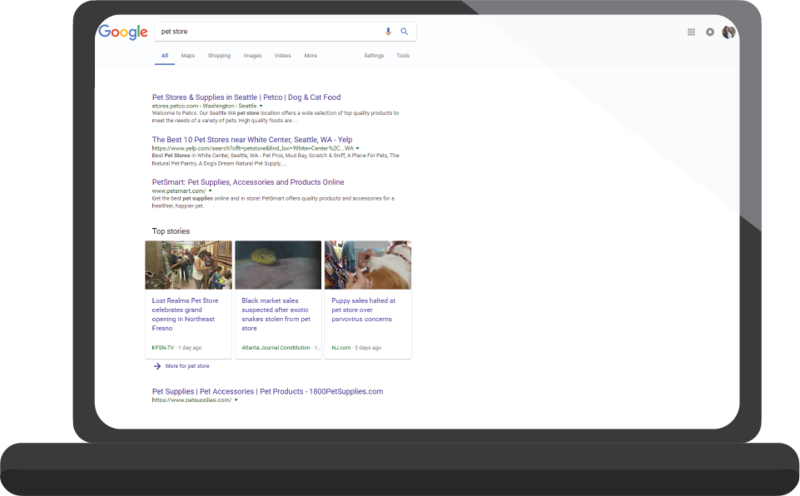 To successfully pull this off, you’ll need a basic grasp of search engine optimization (SEO) and some time to create content that educates and engages your consumers. As a pet business owner, chances are you don’t have a lot of time to dabble in website marketing. However, that doesn’t mean you shouldn’t blow it off, as the return-on-investment is well-worth the time and money it may take to set it up. Instead of stressing over finding time in your day to manage these tasks, you can outsource the work or even ask some of your staff members to create helpful content that they may be passionate about. Either way you handle it, make sure you have the final say on anything that goes live on the website, as once it’s been published online, it’s next to impossible to erase. Click here to learn more about managing your pet business’ website presence. Once you have content on your site, you’ll need a way to get it out to the world outside of those searching for the specific keywords your website targets. Both email marketing and social media are great ways to share your content to both current and potential customers. Share your newsletter - You can grab a code from MailChimp to easily copy and paste around your website. Click “Signup forms” inside your new list and choose whichever format suits your site best. As mentioned previously, email marketing is only one of two ways of effectively sharing content with consumers. 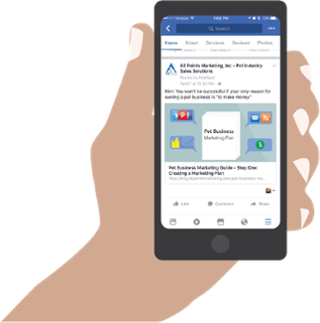 Social media marketing is not only incredibly effective, but it's also much cheaper than traditional advertising methods. Social media has recently become a valuable tool for businesses to attract and connect with their customers. Because so many consumers are on social media, it allows for a large reach at a comparatively low cost. Many pet businesses are not taking full advantage of this valuable resource, meaning if you are able to figure it out for yours, then you immediately have an edge over your competitors. We recently published a guide to engaging on social media, which you can read here, but to sum up, you can get started with these four simple steps. When you’re engaging on social media, there’s a few different types of audiences you can be targeting. First of all, engaging with the brands you sell in your business is a great way to increase your reach and create a community with your vendors. Once you’ve built up a relationship, your vendors will be a great resource to share your posts and extend your reach to their followers as well. The key is to build up a relationship by promoting their products when relevant and making sure you’re following along their feeds as well. Secondly, engage with your current customers. When customers buy from you, be sure to promote your social media to them and encourage them to follow you. You can do this by hosting giveaways, giving them a small discount upon engagement, or any other creative way you can think of. Your customers are your best bet to creating loyal fans of your brand who will come to you again and again. Finally, engage with potential customers in your region. You can do this by searching and monitoring popular hashtags in the pet industry and in your area. For example, if you are located in San Diego, you might want to try searching the hashtag #sandiegocats or #sandiegodogs. While the reach might be smaller, it’s much more targeted towards consumers who are already in your area. These people are much more likely to come into your store than those who post under more popular hashtags such as #catsofinstagram. Keep a list of popular hashtags and use them and refer to them on a consistent basis to build up a community. You can also engage on social media by participating in “holidays” and events that are relevant to your business. For example, National Pet Day was April 11th this year. If you didn’t post anything with the hashtag #nationalpetday on April 11th, you might have missed out on some valuable exposure. If you’re a pet specialty retailer, what you specialize in is selling pet supplies to pet owners in your area. However, one way to boost pet food sales might be a little more outside the box than you’d think: adding a service to your pet store. In Pet Age’s Retailer Report in the January 2017 issue, several pet specialty retailers were asked what kind of ancillary services, if any, they would be offering within the next two years. 33% of respondents reported adding grooming and 33% also reported adding a self-service dog wash. 27% reported adding pet boarding, and 20% reported offering day care or grooming to their selection (pg. 16). Additionally, Pet Age ran a survey last month and discovered that 20% of pet retailer sales come from ancillary services in April 2017. How does offering these services benefit your sales in pet food and otherwise? Simple: These services bring the pet owners in, with their pets, to take care of something. This increases your store’s foot traffic. Then, once they’re in your store, your displays will be set up in such a way that converts your increased foot traffic into pet supply sales. Imagine you have a pet owner coming in to get her dog groomed, and she realizes she needs dog food while she’s there. She goes up to the display in the front offering her favorite brand on sale, she purchases it while waiting for her dog, and a sale is made. We get that adding a service isn’t simply as easy as plopping down a bath tub in the corner of the store (taking up valuable shelf space) and telling your customers “have at it.” However, if implemented correctly and a part of an in-depth marketing and business plan, it could have dramatic benefits to increasing pet food and supply sales in your store. There’s one more simple way to increase pet food sales in your store, and that’s simply by promoting pet ownership in general. As a whole, pet ownership was in decline in 2012. In 2012, 36.5% of U.S. households owned dogs as compared to 37.2% in 2007. Similarly, in 2012, 30.4% of U.S. households owned cats as compared to 32.4% in 2007. This trend is repeated in most other pet categories as well. With that said, there are so many advantages to owning a pet. According to Petfoodindustry.com, owning a pet can mean anything from enhancing recovery from serious illnesses to offering therapeutic and psychological benefits. Promoting these perks is a great way to increase pet ownership in your community. Without pets, there is no pet industry. It’s also crucial to promote responsible pet ownership within your community as well. Whether it’s by hosting events and classes or writing articles, educating pet owners on responsibly caring for their pets is our duty as pet industry professionals. For example, Supreme Petfoods recently put together a toolkit to help correct rabbit misinformation on the Internet. Their toolkit is designed to help retailers in the United States educate and engage with their customers about responsible pet ownership. Click here to download the toolkit and decide for yourself whether this would benefit both your business and the life of pets overall. As you can see, there are many valuable ways you can boost your pet food sales within your store. Implementing these steps will ensure you not only appeal to more potential customers, but also keep the loyal ones engaged and even promoting you within their communities. Begin by investing in Internet marketing, move on to engaging on social media, consider adding a service, and finally promote (responsible) pet ownership in your community. Having a strong pet business marketing plan will also ensure you get more customers in your store and buying the pet food you so carefully procured. However, it might not be so easy to get started if you don’t currently have one. Our Complete Guide to Pet Business Marketing in 2017 will walk you through the steps it takes to create a successful marketing plan, manage your website presence, and further engage on social media platforms. Download it for free today to get started boosting your pet food and supply sales! Ashley Hoffman – E-Commerce & Digital Marketing Manager joined the All Points family in 2015 and adds a little bit of fun to the team with her creativity and dumb jokes. Ashley is always on the lookout for the latest trends in marketing and applying it to how All Points does business. She is the blogging guru, social media master, e-commerce account management expert, and brand builder all in one. The best part is that she’s the loving owner of two beautiful cats named Kitty and Chewbacca. 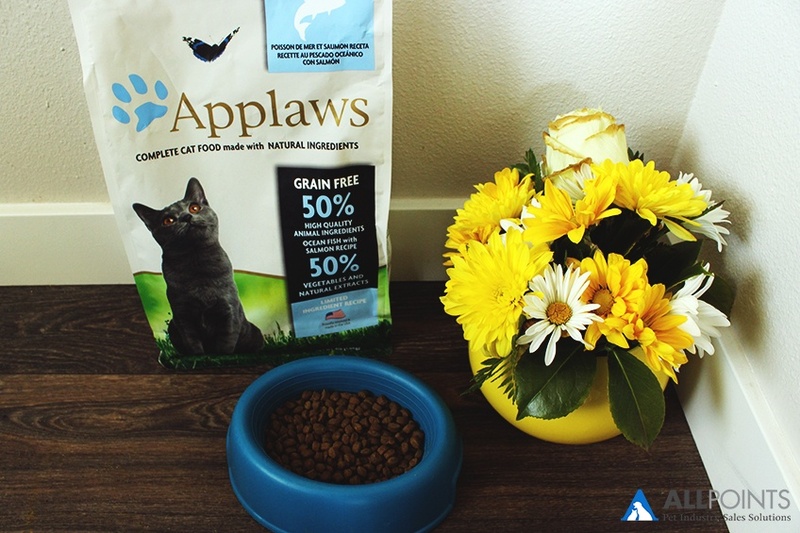 Applaws Answers: Why Limited Ingredient Pet Food?